Randy's Layout Blog: Modeling from a Photo: Rare or Not? I've talked a bit about the trackwork and ballast in earlier posts, and focused a bit on a set of photos taken in 1949. The first photo was published in an early NHRHTA calendar, which I don't have, but the photographer was credited there. I still need to dig that up. The second photo is a slide that was obviously taken moments before. This time I'll take a closer look at the equipment in the photos. Jerry Stewart identified it as a Litchfield and Madison gondola, to which he said any midwest railfan/modeler would be able to identify. Apparently he's the only one that reads my blog! I found a couple of photos which don't appear to be available online anymore, but I do have a plan that looks pretty darn close. A kitbash using an Intermountain USRA composite gondola seems the obvious starting point. I've considered the Detail Associates end, but the horizontal ribs are in the wrong location, so I'll either modify them or find a different solution. Decals are also an issue, in part because I haven't found any, and also because I haven't located a better photo in this paint scheme. On the far yard track is Mather reefer leased to Morrell, once available as a Sunshine kit (which I have). 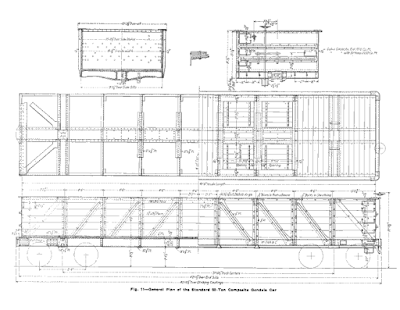 The Red Caboose model could be a stand in, but has wood instead of steel ends. The kit has the large, red, rectangular "Morrell" lettering instead of the simpler lettering seen here, so I'm still working on that detail as it's not as simple as just leaving it off. Note that there are two baggage cars on the station stub track for the storage mail to the left and Ted Culotta noticed the clerestory roof behind the gondola, which was revealed in the slide we found later to be another baggage car. 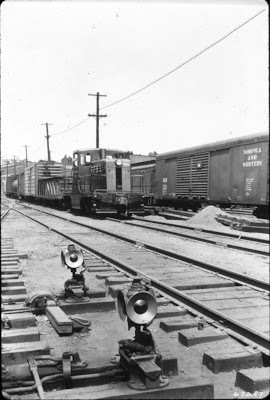 The car in the yard, and the one farther away on the station track are both wood baggage cars, released by Bethlehem Car Works. The model used an early set of plans, so the doors are in the wrong location, and there are a few other missing details, such as the way the bolsters wrap around the side, but it's easy enough to fix. The steel baggage car is a long out-of-production F&C/NHRHTA kit that Steve keeps threatening to redo as a one-piece body. I have several of those in progress as well. Perhaps 5 baggage cars were dropped at the yard on Monday, and moved into position through the week. If so, then this picture is a Wednesday, or a Thursday if they started with 6 cars to include Saturday. As I've noted, these were for storage mail, to be forwarded to Hartford on passenger train #463. An interesting operating opportunity, and one that might also give a visual hint as to which day of the week it is on the layout at a given point in time. But I don't have any other pictures with this many baggage cars in the yard. In most cases there is only one at the station. The N&W #52136 is a B-3 auto car. These were essentially exact copies of the PRR X32A box cars. Well, the final 50 X32A cars with a 14' 6" door opening, meaning the side sheathing pattern is three panels to the left of the door, and five to the right. Naturally, all of the released models are of the earlier X32A cars, with a 12' 1-1/2" door opening and four panels to the left and five to the right. I have an old NKP brass model that I'm modifying. The Bowser underframe fits perfectly, so it's a matter of figuring out how to shave off the rivets. I'll need to find the right doors and use Archer rivets for the new panels. Not sure if there are appropriate decals yet. The Milwaukee rib-side car is #20945, the series represented by the Exactrail model. Sunshine and Rib-Side cars also released models of this series. Of course none of these are still in production, but I have one of the Exactrail models. I gave an Exactrail kit to Chris years ago because we see lots of the rib-side cars in photos of the Valley Line. 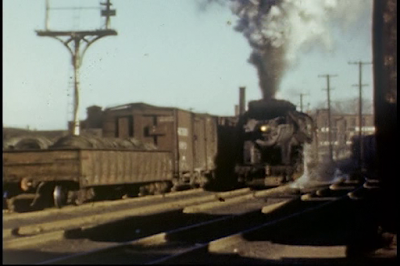 If you look closely at the steel box car in the consist, it has the Pullman-Standard proprietary end used on the so-called "PS-0" cars. The only cars I know of that used that type of end with a Youngstown door rather than Superior is the B&O M-55A class. 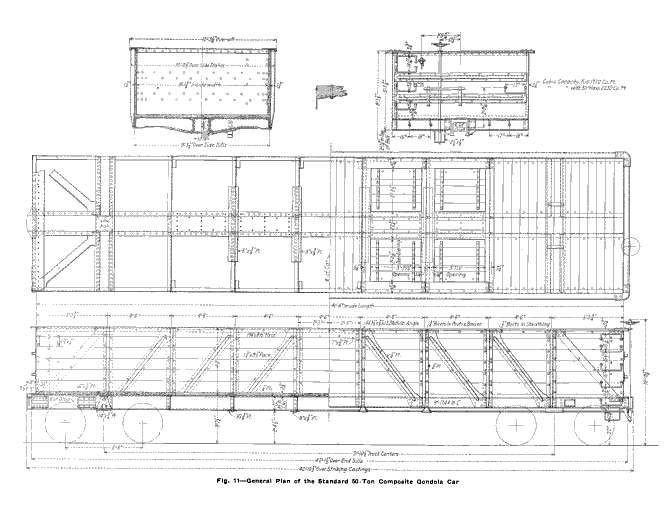 They were a 1937 AAR standard boxcar with the Pullman-Standard end and Duryea underframe along with a flat riveted roof. An Intermountain kit with new ends and roof would work, but the F&C end is too short to use as is and is lacking the rivet line separating the upper and lower panels. Scratchbuilding may be the best option. The Speedwitch Duryea underframe for the M-26D/E conversion would work well here, although I don't know if the layout was identical to those classes. Sylvan makes a flat panel roof that might be appropriate, part DP-0046. The remaining cars are as-yet-unidentified: a single-sheathed box car (the bracing pattern along with the door will help narrow the field); a tank car (looks like a fairly fat tank, an the ladder and frame may give some more clues); and a covered hopper. The scheme on the covered hopper is a light color, so it very well could be one of the 15 cars that the NH rostered in 1949. It was almost certainly for cement. The Intermountain kit is the go-to kit for these cars with Speedwitch decals for the earlier NH scheme. The 44-tonner is a phase Ic, I'm using a W&R brass body on a Bachmann chassis. All in all, an interesting collection of freight cars in a small yard on a branch line in CT in 1949, and a signature scene to be recreated on the layout. A common comment I've heard is that you have to be careful when selecting freight cars from photos, because people tend to take pictures of the unusual and rare cars. While I think that there are times that this is the case, looking at the "whole picture" is important. Looking at this series of photos, while there are a number of what would be considered "rare" cars, none of them are featured. The L&M gondola is certainly a rarity (in 1950 they rostered 559 cars with two classes of composite gondolas with 98 and 144 cars in each), but it's not the focus of the photographs. The other rare cars would only be identified as such by somebody familiar with freight car construction and rosters overall. These photos are clearly of the train working on a given day, with whatever cars are there. That's not to say that an L&M gondola appeared in New Britain daily. Statistically, there's a high likelihood this is the only day it ever appeared here. Another example is a photograph that's published in Trackside Alongside the New Haven 1950-1956 with Arthur E. Mitchell. Arthur worked for the New Haven as a brakeman and a conductor during this period, and took photos regularly. On pg. 47 is a photo of a car that they knocked off the track and cost him 3 days off with no pay. The photo is one that documents a particular point in time. 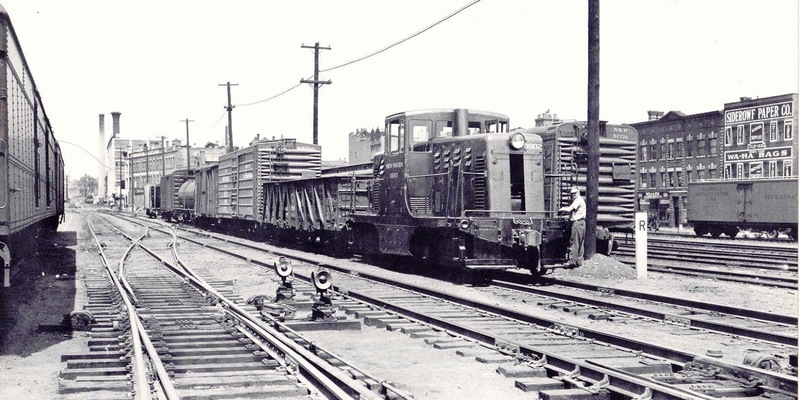 The fact that it happens to be a CN&L single sheathed box car in the mid-'50s is just a bonus for us. 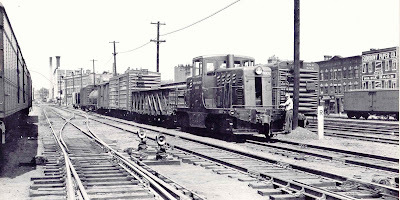 The entire roster for the Columbia, Newberry & Laurens in 1950 was 49 box cars, 25 with steel underframes, and 24 single-sheathed with steel underframes and steel ends like the one in the picture. The photo is undated, but he didn't start working for the New Haven until 1952. I'm lucky in that prolific New Haven photographers Kent Cochrane and Tom McNamara happened to live in New Britain. Their criteria was based on the weather and time of day. They were looking for good shooting conditions, and then would work a series of locations, or often follow a train taking a roll of pictures along the way. Again, these are random days and the subject is whatever happened to be on the rails that day. They had an opportunity to take photos, and they didn't go to see whether there was anything interesting and go home if it was the same old thing. Just for fun here's another rarity sitting on Track #5 in New Britain. The date is unknown but it's a screen grab from a color video taken by Paul Wales from his office in the Stanley Tools building. The L-1s were replaced by FA-1/FB-1/FA-1 sets in 1947, so I'm guessing c1946. But anytime in the '40s would make the Southern SU box car with the older "T"-braced end rare. There are more captures from this video in this post for those who care to start the process of narrowing the era based on the freight cars in the video for me!